After a decade-long absence from truck camper production, K-Z RV returns as the new management team for Livin’ Lite. In addition to a new factory, new model changes and new floor plans are on tap for 2017. After Thor Industries purchased Livin’ Lite from founder Scott Tuttle in August of 2013, Livin’ Lite moved factories and changed management teams twice. 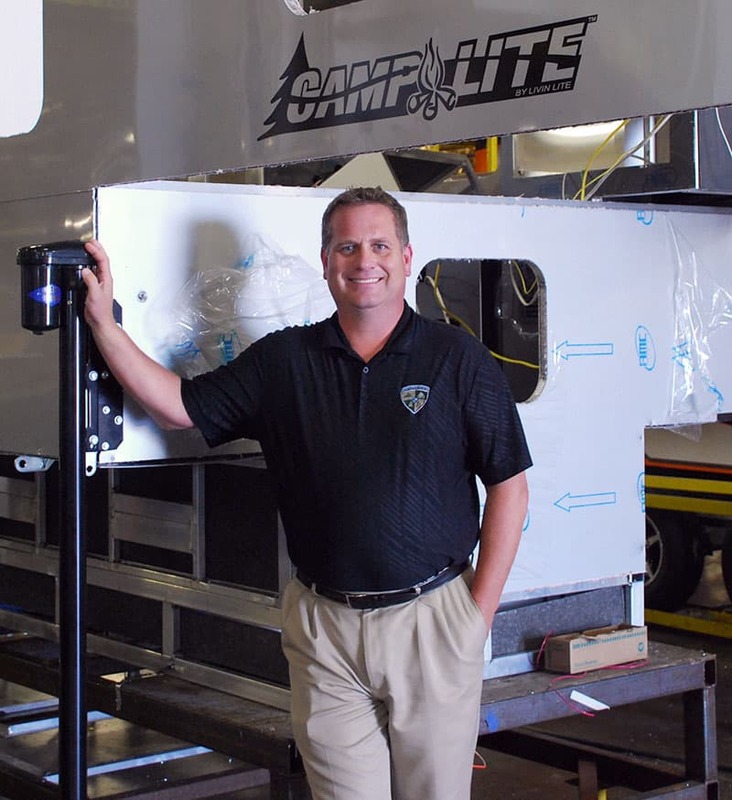 The first move disrupted production for months causing significant supply issues for Livin’ Lite’s CampLite, Ford, Quicksilver, and Jeep branded products. The second move occurred this past March when K-Z RV took over the management and production for Livin’ Lite. With careful planning and preparations, K-Z reported that production was down for only a week and that Livin’ Lite travel trailer and truck camper products were already moving down a dedicated Livin’ Lite production line. That sounds fantastic, but all too often big companies purchase smaller companies and let the bean counters cheapen the product quality for quick profits. Talking to passionate Livin’ Lite dealers and owners, this is certainly a major concern with Thor’s acquisition and the two subsequent factory and management moves. As you’re about to read, K-Z RV is determined to avoid this outcome and return Livin’ Lite to the 100-percent no-wood concept that made the company one of the most successful RV start-ups in recent history. They also have a list of material, appliance, and design improvements in the works, and at least two all-new models for 2017. To find out how K-Z RV plans to return Livin’ Lite to full strength, and then take the company to the next level, we talked to Dave Boggs, General Manager for Livin’ Lite. TCM: Congratulations on your new position as General Manager for Livin’ Lite. Tell us about your history in the RV industry, and how you came to work for K-Z RV. Dave: It’s been a journey. I grew up tent camping with my three older brothers in my parent’s station wagon. Then we got a truck topper in the late 1970s. That was my first experience with camping in the back of a pickup truck. The topper was a very basic set-up by today’s standards. Out of college, I worked with an Elkhart area marketing company and had several RV manufacturers as clients, including a Thor company. That eventually led to a position at K-Z RV as the Director of Marketing. Now with four kids of my own, my family goes camping at least four weeks a year in one of our RV products. What better way to learn our products than to use them? These experiences lead to purpose-built features that go into every product line we manufacture. TCM: It’s good to see industry leaders using the products they manufacture. We’ll have to get you and your family into a CampLite truck camper down the road. What is the connection between Thor Industries, K-Z RV, and Livin’ Lite? Dave: Livin’ Lite and K-Z RV are separate manufacturers that share a management team and operate under our parent company, Thor Industries. This structure allows for a wide range of advantages and efficiencies including product development, product audits, and tremendous purchasing power. Quality is another benefit. For example, we are very particular about the suppliers we partner with. We deal only with the best, but not necessarily the cheapest. Our vendors need to uphold the same standards we do as a company. The end users get a better product that way. Thor Industries bought K-Z in April of 2014. Since then, Thor has stayed out of our day-to-day operations. We remain a standalone company. TCM: About ten years ago, K-Z (under the brand Sportsman) made a decision to get out of truck campers. What’s the history with K-Z and truck campers? Dave: I can tell you a story about truck campers and K-Z’s founder, Mr. Daryl Zook. Mr. Zook first RV was a truck camper that he sold to a dealership in Iowa. He invested his entire life savings into this camper, which blew off his truck while delivering it, and exploded into a thousand pieces. Like a true entrepreneur, he did what it took to build another camper and make his delivery. Today, K-Z has over 400 employees. The company was founded on his inspiring work ethic and manner, and how he took care of his customers. Mr. Zook has been a good steward to the K-Z community and team.